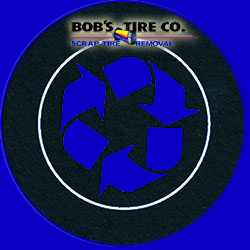 Scrap Tire Removal in New England & New York | Bob's Tire Co. | Tire collection and recycling serving New England and New York including Massachusetts , Maine, New Hampshire, Vermont and New York. According to the EPA about 45% of reclaimed scrap tires are incinerated as a fuel. Scrap tires can either be incinerated whole or shredded first. Tire rubber contains approximately the same energy density as oil, and its emissions contain fewer toxins than coal. Ground tire rubber, also referred to as crumb rubber, is one of the fastest growing applications for scrap rubber. The tires are shredded and ground into a granular texture, and often added to another product as an aggregate. The primary application for crumb rubber is asphalt. Adding crumb rubber to asphalt increases the longevity of the roadway and improves driving conditions. Shredded rubber is often used in civil engineering applications, such as subgrade fill and embankments, and septic system drain fields. Another widespread use for crumb rubber is in recreational facilities, including athletic fields and playgrounds. Crumb rubber is used as an aggregate in the material for running track surfaces, and is added to soil in grass playing fields to increase resilience and drainage. Scrap tires can be used in whole or in large part for a variety of applications. Whole tires are often used for highway crash barriers or bumpers for marine applications. People can reclaim individual tires as planters for urban settings or classic tire swings. Tires are also often recycled by cutting them into various rubber products after the steel belting has been removed. Products created from parts of whole tires are used in a large part by the commercial fishing industry and also on the bottom of snow plows and loader buckets. Tire piles, legal or illegal, pose at least two health threats: pests and fire. Many disease carrying pests flourish in tire piles. Especially, many kinds of mosquitoes that prefer to breed in the quiet, stagnant water that collects inside tires. Several varieties of mosquitoes can carry dangerous or even deadly diseases, including west nile virus, encephalitis and dengue fever. Control and eradication programs, short of removing the pile, are difficult. Fire presents a second threat. Scrap tire fires are difficult to extinguish, and can burn for considerable periods of time. These fires release heavy black smoke and can possibly contaminate the soil with an oily residue which can cause considerable damage to the environment.